Would you willingly let a 5 year old run your life???? ...Just because you don't know another way... Well, I have discovered the way... and it's The Most Effortless... Whether you have an addiction, eating disorder or simply desire to live the life meant for you... read on!... . ~ NEW FREE live "Ask Pam Ragland" calls - Get help f or YOUR specific situation - FREE for a limited time only! ~ NEW FREE live "Ask Pam Ragland" calls - Get help for YOUR specific situation - FREE for a limited time only! ...You really can use the Law of Attraction to Have Anything(TM) you choose! ... Did you know despite financial success, more than 97% of people are NOT LIVING THEIR PURPOSE? ...Or achieving their full potential? ... Or that more than 97% of people DON'T EVEN KNOW WHAT THEIR PURPOSE IS? How can you change this? How can you make The Law of Attraction actually work for you? ...Experience PEACE & HAPPINESS for no reason! ... And LIVE YOUR PURPOSE!! ...Use The Law of Attraction to your full advantage! But WE ACTUALLY PROVIDE HAPPINESS!! over...and expecting a different result! Have you ever wondered why successful people seem to have a magic wand? They know & live their purpose? They know the Law of Attraction and they effortlessly use it? Do you want to know how to have your own magic wand…and use it successfully and easily? What if you could Have Anything™you choose…effortlessly? ~ And by 5 one third of your thoughts were already negative -- more than a million negative thoughts already! ~ The times you recall the least have the largest impact! ~ If you’re like most adults, you are acting largely out of your childhood mind ... on autopilot... and mostly negative at that! ~ The result? Your negative thoughts are working against you... and you don't even know it. You are not in the driver's seat of your life. ~ You end up struggling with the same challenges over and over. You fail to achieve your potential. Your life is limited. We are pioneers. We help anyone who is determined to improve, remove their barriers to anything (true happiness, your purpose, a fear, phobias, addictions of all kinds, obsessive-compulsive disorder, past trauma, or just blocks to accomplishing a goal) ...quickly and effortlessly!! 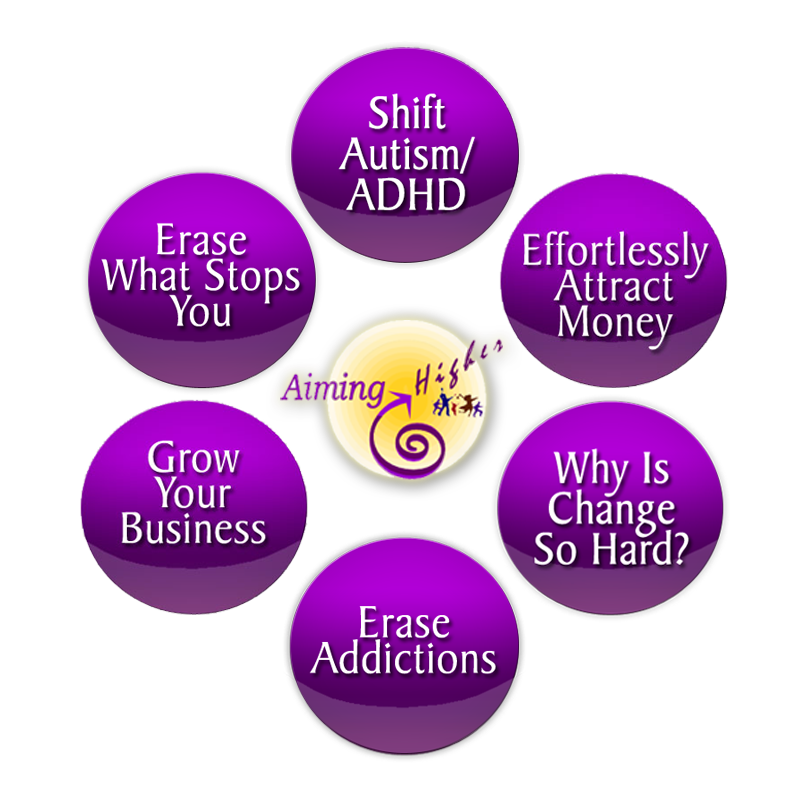 ~ We specialize in helping you eliminate negative thoughts once and for all. Simply. Quickly. Effortlessly. ~ In fact, there is no faster, more effective, or effortless way known on the planet today! ~ Do in 11 days or less what would take more than a lifetime--more than 2,000 years in fact--with any other method out there today! (Quantum Thought ShiftTM) Just 2 mos. post shift..."...I have done extreme work around the boy who date raped me in the summer after high school. I have done traditional therapy & hypnosis with the 1st & 2nd observer positions, blah, blah, blah. Still, after 30 years, the trauma remained. Then I was "shifted" by Pam. Upon waking from a dream about him, I felt peace and compassion for him, and complete forgiveness for the first time. I had a smile on my face and haven't felt so good or free. I hoped, but didn't imagine, I would ever be completely free from it. Thank you so much! This is a gift I never expected from taking this program, & I can't tell you how wonderful it is! With love & gratefulness for you." (Thought ShiftTM) "When I started this work, I could hardly imagine making my sales quota. My own thoughts kept me being mediocre, and I could hardly imagine anything else. In the first month, my close rate dropped dramatically. After just four months, I am the #5 sales rookie in my company, my close rate is 80%, and my sales have quadrupled. I can now easily envision being number one!" (Thought ShiftTM-child) "At Mommy and Me, another boy yelled at my 2 yr. old daughter her when she was trying to play with another girl. It really hurt her feelings. She welled up in tears, and was not the same happy, carefree girl for the rest of the class. I immediately took her to work with Pam. As she played with the toys, they talked about the incident. The root cause was a feeling she might not be wanted, passed on to her in utero. Pam used Thought ShiftingTM to eliminate her emotions and the issue. The results were so great! Before whenever my daughter talked about the incident, she had tears in her eyes. Afterwards, she was happy, with no signs of negative emotions. She even wanted to invite the "offending" boy over to play!! Now, she easily makes friends in her class. What a gift to eliminate such a huge thing so early, which otherwise would have impacted the rest of her life!" She asked me if I wanted to put him to sleep... she really thought it was the end. I said NO please do what you can, he is not ready to leave (I was not ready for him to leave!) She pumped him full of fluids, gave him a Penicillin shot and told me that was his last chance. He has many health issues including an enlarged heart & is on meds for that. I came home very upset & called Pam. She told me there were things I needed to do, and if I would do them she could help him. For me, I needed to promise Freeman I would start taking care of myself, & quit focusing my whole life on him...which I have been doing for 3 years now. Meanwhile, Pam told me she would "shift" him immediately. I took him back to the vet 3 days later on Sept. 23 & my vet drew blood & came in looking shocked... This was the day she was to put him to sleep, so I thought the worst. She said his Creantine had dropped down to 2.0... It was a very dramatic drop in such a short amount of time! She could not believe it & felt bad for even considering euthanasia. He has been doing great ever since his "shift", & his kidneys are now functioning perfectly! His appetite has never been better & he drinks water all day...which is very important with his heart problem to keep the edema away. I have learned to leave the ranch for a few hours & not worry about him. I gained 5 lbs also (which I needed). Pam.....Thank You with all my heart for helping us...I love my boy & am so grateful to you! !